Louise Arbour has confirmed that she is to resign from her position as United Nations High Commissioner for Human Rights. She announced on Friday that she will leave office on 30 June. The 61-year-old former Canadian Supreme Court justice disclosed her decision in a speech to the 47-nation UN Human Rights Council. Reacting to the news, Amnesty International paid tribute to her achievements. Martin Macpherson, Director of Amnesty's International Law and Organizations Programme, called on UN Secretary-General Ban Ki-Moon to ensure that her successor is of a similar high international standard with a proven track-record as a strong and independent advocate for human rights. 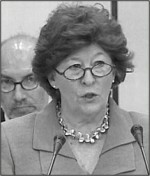 As High Commissioner for Human Rights since 2004, Louise Arbour has been a forceful and formidable advocate for human rights protection, stressing the need to apply and enforce legal obligations and establish accountability for the perpetrators of human rights violations. During her time in office, the resources for the Office of the High Commissioner for Human Rights were increased. Amnesty International has called on UN Secretary-General Ban Ki-Moon to ensure that the new High Commissioner for Human Rights is selected by means of a transparent process that includes thorough consultation with all stakeholders, including civil society. Arbour's office deploys nearly 400 human rights monitors in UN peacekeeping missions in hotspots such as the Democratic Republic of Congo. Her office is independent but works closely with the UN Human Rights Council. Arbour's forthright candour has prompted criticism from around the world, but she brushed this off as "inevitable". According to Reuters, she said she wasn't leaving her job because of these pressures. "On the contrary, I have to resist the temptation to stay on to face them.